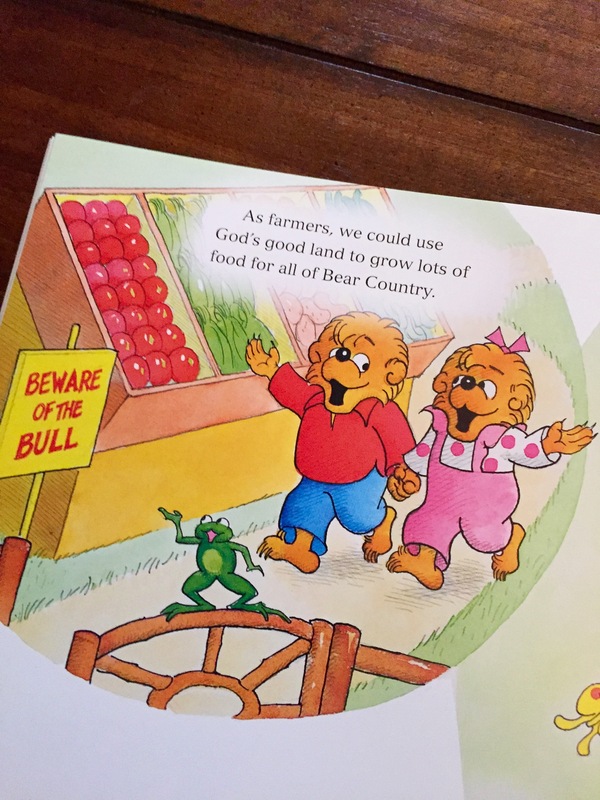 In “He Bear, She Bear,” Brother and Sister (who technically hasn’t even been BORN yet: she first officially appears in “New Baby” which came out in September of 1974; He Bear She Bear came out in August of 1974) take a tour of Bear Country and meet all sorts of worker bears. We see a lot of individuals on the job, doing everything from construction to law enforcement to doctors to teachers to band leaders and more! The book is fairly remarkable for its focus on the fact that all small cubs, regardless of gender, can do jobs of any kind. whether we are he or she. 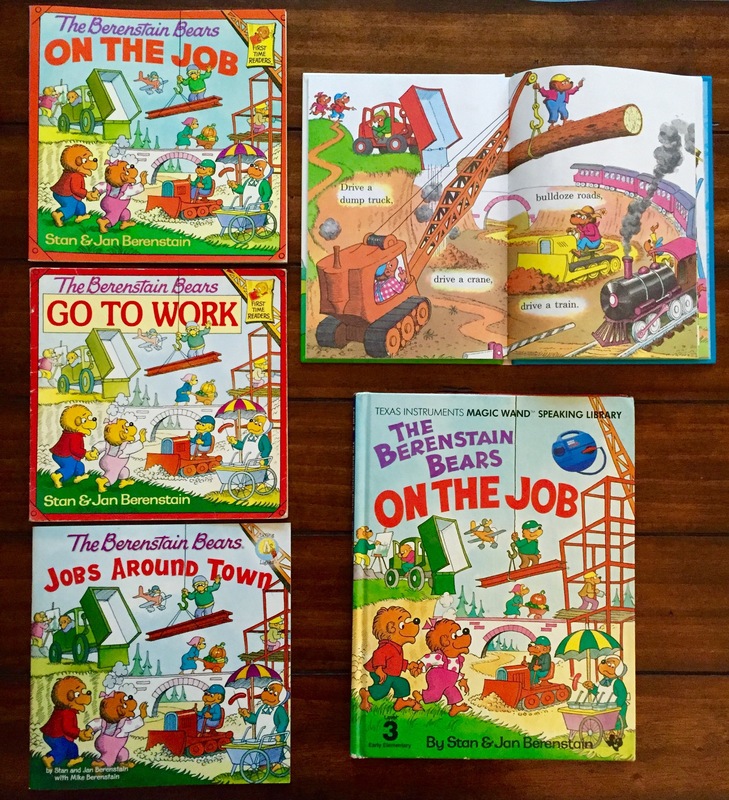 The success of “He Bear, She Bear,” (which seems part Dr. Seuss and part Richard Scarry, in my opinion) spawned a follow-up title, “The Berenstain Bears On the Job” (Texas Instruments, 1983). This unique publication was part of the Magic Wand Speaking Library and required the Texas Instruments Magic Wand Speaking Reader, which is a barcode reader that scans and then reads back the text of the book to the operator. 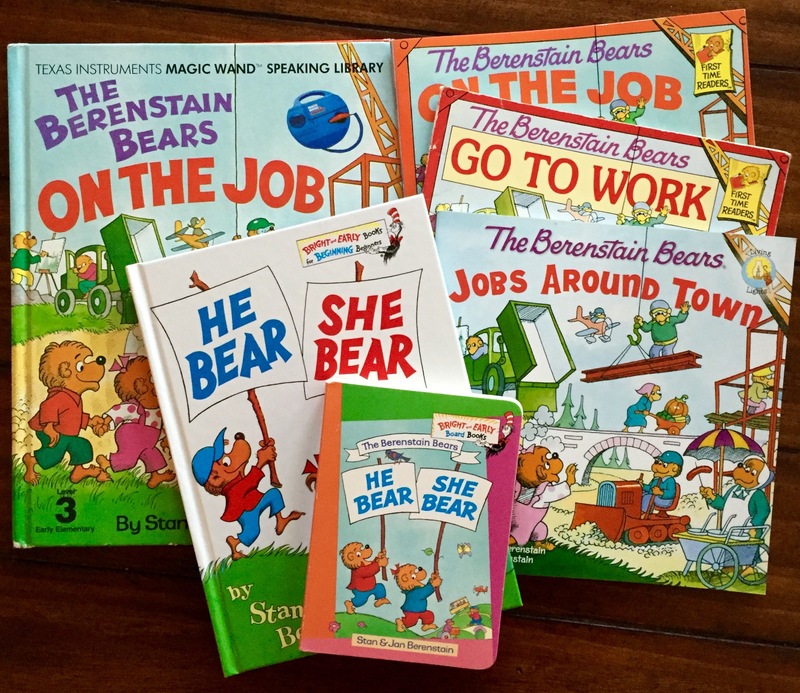 And while this electronic edition was published in limited quantities, The Berenstain Bears On the Job came alive again in 1987 when Random House published the book as part of their First Time Readers series. 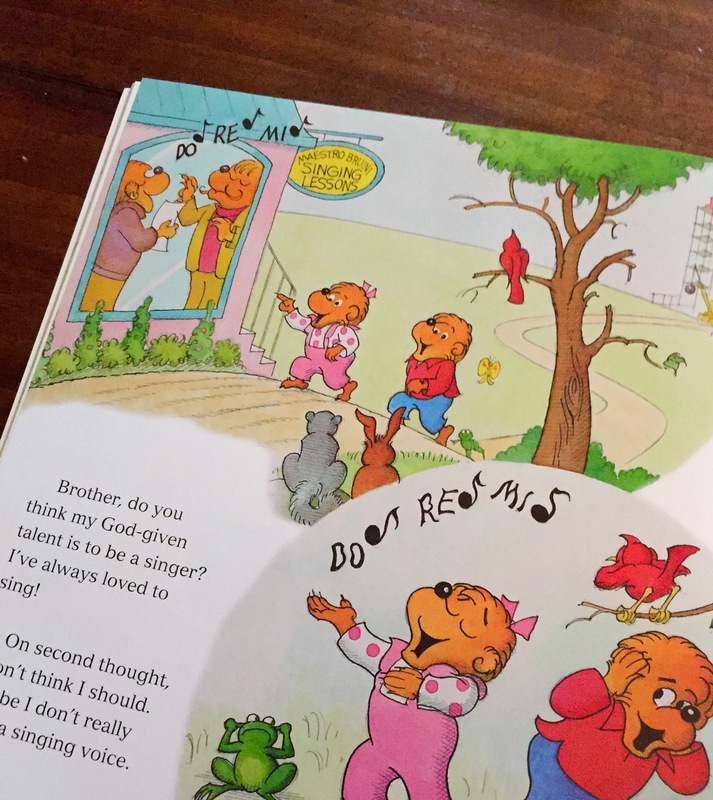 Shortly thereafter, the book was released in the U.K. and Australia under the title, “The Berenstain Bears Go to Work.” This book also includes slight revisions to the story’s text, as seen below. 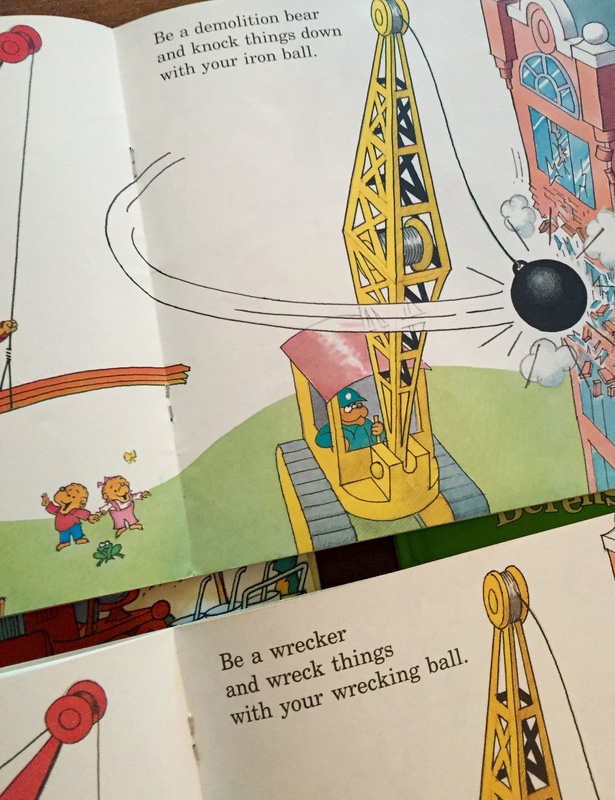 The American to British English “translation” is an especially unique and prized part of any Berenstain Bears collection. The British English edition of “On the Job,” published as “Go to Work” (Collins, 1988). 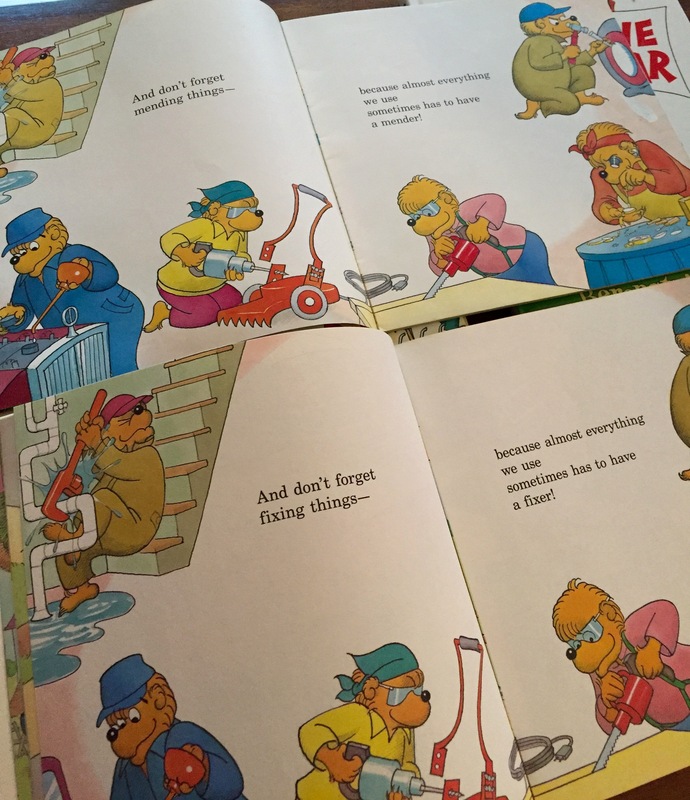 In 2011, the most recent version of “He Bear, She Bear” came out: “The Berenstain Bears Jobs Around Town” (Zondervan Living Lights Series). The book takes the text of the 1987 version of “On the Job,” and adapts it through a Christian perspective. 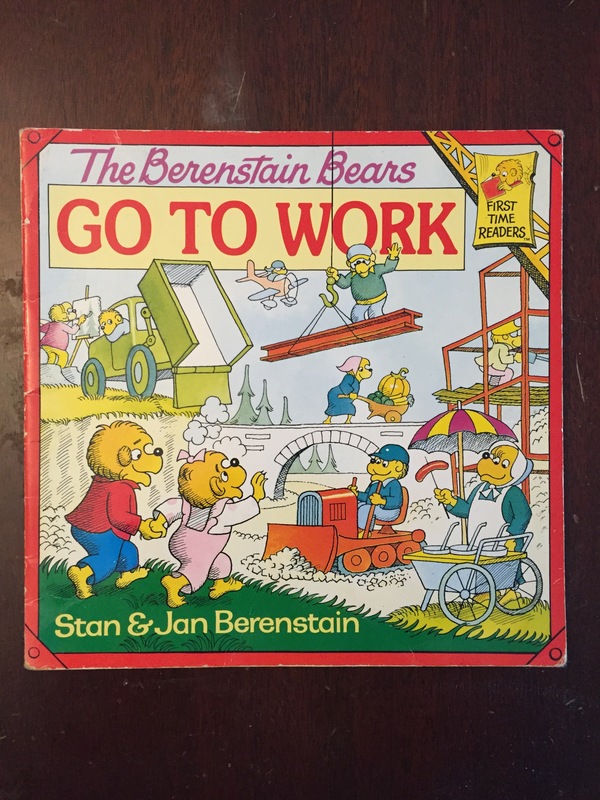 Michael Berenstain (the son of Stan and Jan who now writes all the new Berenstain Bears titles) has adapted the original text of the original story to include Bible verses and a faithful perspective on choosing a future career through prayer and Godly calling. Maintaining the rhyming pattern of the previous books, “Jobs Around Town” makes an odd choice on the final page, awkwardly turning the text of the last couple sentences into standard non-rhyming prose. Otherwise you might consider the adaptation very … faithful. Five versions, with the interior spread of “He Bear, She Bear” that inspired the cover of the subsequent editions.